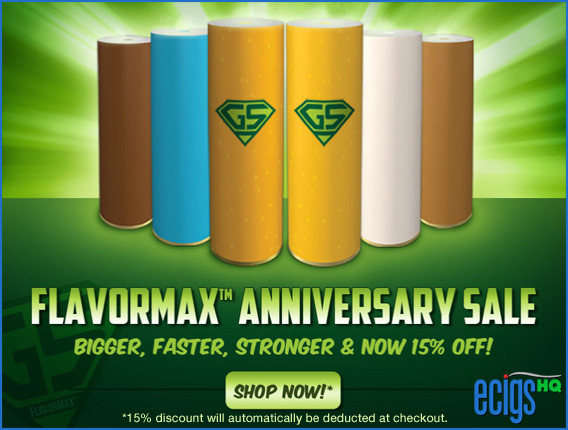 eCigs HQ: Green Smoke FlavorMax™ Anniversary Sale! Home » e-Cigarette Special Offers » Green Smoke FlavorMax™ Anniversary Sale! Green Smoke FlavorMax™ Anniversary Sale! Get in on the Birthday Savings Today! It’s difficult to believe, but Green Smoke FlavorMax Cartomizers are already celebrating their 1st Anniversary. While Green Smoke has always been known for crisp clean flavor, in one short year since their introduction, FlavorMax cartomizers have established themselves as the world-leader in electronic cigarette vapor production. Best-in-class FlavorMax Cartomizers are available in your choice of Absolute Tobacco, Menthol Ice, Mocha Mist, Smooth Chocolate, Tobacco Gold, or Red Label Tobacco flavors, and come in 5 satisfying Nicotine levels for your e-smoking pleasure. To take advantage of the birthday savings today, visit the Green Smoke website by clicking the banner above or the link below, then click the Facebook “like” button to receive 15% OFF your Green Smoke FlavorMax order! The discount will automatically be deducted at checkout, so no coupon code is necessary. But you will need to hurry, as this is a strictly limited-time offer.